Having read Star Trek Memories, I almost immediately moved to its sequel, published the following year, which I suddenly realized was more than twenty years in the past. 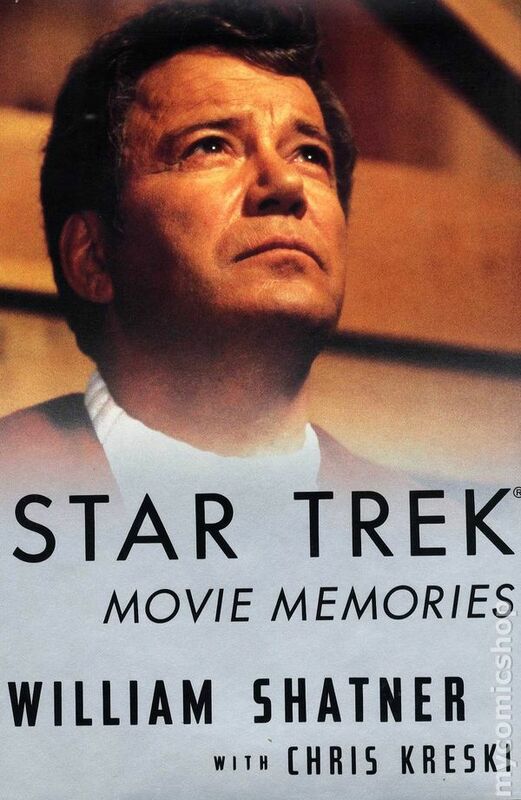 Movie Memories, written just a couple of years after Star Trek VI finished production, would have covered a longer time period, at least calendrically if not in terms of actual production time, but most of it would certainly have been fresher in Shatner’s mind. I say almost because I decided I didn’t want to overdose, so I let a couple of months go by before picking up the sequel volume. A couple like nine or ten. This isn’t the same kind of book as the first volume. Well, it is still a memoir, but this time Shatner presents the memories much more chronologically, in a very linear fashion moving from one movie to the next. There are still plenty of anecdotes, and he’s still going to other people for bits and pieces of Trek history he didn’t know. But, covering seven movies across fifteen years, this memoir proceeds at breakneck speed to get everything done. I learned things about each of the movies, and Shatners feelings about the process, production, and many things connected to each of them. I would have like to learn more. And, in fact, it actually covers a larger time period than that, giving us a glimpse of the harder times between the series and the movies, and Shatner’s work and work ethic getting through them. For me, I feel like the most interesting parts of the book were his reminiscences around Star Trek V, a film considered disappointing by so many fans, and Star Trek: Generations. For me, Star Trek V is not a bad movie, though it’s not a particularly good Star Trek movie. I can find things to enjoy in it even as I find things that disappoint me. Shatner spelled out his own disappointments in the way production went and all of the compromises he and the production team had to make to get the job done. The initial vision had been so much grander, but events and budget restrictions, and artificial time constraints conspired against the film. Star Trek: Generations brought us the death of Captain Kirk. (Should there have been a spoiler alert there? It’s been 23 years.) I really enjoyed Shatner’s discussions on how he felt about that, and all the things he experienced and felt running up to it. This book was released on the heels of the movie and death of a character he’d played for more than 25 years must still have been fresh and raw. But his memories of both of those films, along with all of the others, went by too quick. Overall rating: 4 stars. I finished my review of Star Trek Memories with two sentences. I just wish it was a lot longer. Although there is a sequel. I think I’d like to echo that for this one. I wish it was a long longer. I also wish there was another sequel. What’s up,I read your blog named “Book Review: Star Trek Movie Memories – Lance Schonberg” daily.Your humoristic style is witty, keep it up! And you can look our website about powerful love spells. Clearly spam, but original. I think I’ll keep this one.